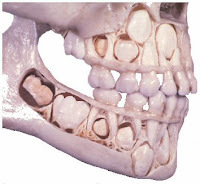 Baby tooth formation and eruption influence the development of the alveolar bone (jaw bones). The typical dental eruption of the baby tooth occurs symmetrically and begins as early as six months of age. The first two baby teeth to erupt are the two mandibular central incisors (lower middle front teeth). Prior to a dental eruption, the child increases salivation, has localized gingival inflammation and becomes irritability. These symptoms, usually, subside as the baby tooth erupts into the oral cavity. Occasionally, baby teeth may delay in eruption without other abnormalities and may consider as a normal variation. Longer delay can associate with delayed bone age or failure to thrive. In a rare case, retarded baby teeth eruption may relate to hypothyroidism, hypopituitarism, osteopetrosis, rickets, chondroectodermal dysplasia. Unlike permanent tooth, the spacing is desirable in a baby tooth; it signifies enough space is available for a larger permanent teeth. Early extraction of any baby tooth may affect the future alignment of the upper and lower permanent dentition. Due to the safety concern: FDA warns not to use any anesthetic ointments or any topical medication e.g. : lidocaine 2%, benzocaine gel and liquid to relieve symptoms from teething. Children should stop using pacifier and bottle by the age of 18 months. Prolong used of pacifier and bottle can cause malocclusion at first and may worsen, resulting in deformity of the jaw if the habit persists. Before the age of 5, thumb sucking considers a normal behavior. If the habit persists after the age of 5, the sucking action creates a force that may alter dental arch development. In a severe case; it may cause an open-bite and a posterior cross-bite. When should you clean your child's baby teeth (primary teeth)? You should thoroughly clean baby's teeth once the first tooth erupts, usually, when a child is 6-month-old. After each feeding, you may use a delicate, moist, clean cloth or gauze wrap around your finger or a soft small head baby toothbrush without toothpaste to clean the tooth. Rinse the brush with hot water before and after brushing. Change toothbrush as soon as the bristles appear frayed or after any illness. Include toothpaste only if your child understand how to discharge the saliva, usually, close to age 2. For the 2-5 years old; aid your child 's tooth brushing using a pea-size quantity of toothpaste without fluoride. Although the proper amount of fluoride helps prevent and control tooth decay in children, regular intake of fluoride more than optimal amounts can be harmful. ADA (The American Dental Association), AAP (the American Academy of Pediatrics), and AAPD (The American Academy Of Pediatric Dentistry) have created the guidelines to regulate the intake of fluoride. According to guidelines; infants under the age of 6 months should not receive any fluoride supplementation. For children 6 months to 6 years; maximum dose is 0.25 to 0.5 mg/day. Children aged 2-6 years should use no more than a pea-size amount of fluoride toothpaste with parents supervision. Children in this age group tend to have poor control of swallowing reflex, results in frequently swallowing toothpaste placed on their toothbrushes. A possible adverse effect associated with fluoride is the development of dental fluorosis. In children age, 8 or less, ingesting fluoride above the optimal level during enamel development can cause accumulation of fluoride that lead to enamel fluorosis. Once the tooth formation is complete (maturation), the enamel is no longer susceptible to fluoride. The severity of fluorosis depends on the duration, dose, and period of fluoride intake. You can learn about fluoride levels in your drinking water from your local water utilities or Center for Disease Control and Prevention (CDC). CDC issues the optimal fluoride for drinking water range from 0.7 ppm in warmer climates to 1.2 ppm for cooler climates. The study found, average dosage infants receive from drinking the fluoridated formula is between 0.11 to 0.14 mg/kg/day or 0.4 to 0.78 mg/day. “Our results suggest that breastfeeding infants may help to protect against fluorosis. This is consistent with other studies that suggest that consuming infant formula reconstituted with tap water increases the risk for dental fluorosis. Importantly, this study shows that the protective effect of breastfeeding is important not only in fluoridated communities but also in non-fluoridated areas. How to prevent tooth decay (cavity, caries) from baby teeth? As soon as the very first tooth erupts, children must not go to sleep with a bottle of fruit juice or milk in their mouth. Don't soak pacifiers in sugar or honey before giving to the baby; sugar is very harmful to the baby tooth. Thoroughly clean baby's teeth following every meal with either delicate-moist-clean cloth or delicate-baby toothbrush without having toothpaste. The cleaning will likely get rid of oral plaque buildup that may damage baby's teeth. Reduce the chance of transferring microorganisms towards the baby by not sharing spoon, pacifier, foods and drinks with any person. Educate and encourage children to clean their teeth with soft bristle toothbrush and a pea size toothpaste when they're old enough to follow the instruction. According to The American Academy of Pediatric Dentists; children should be seen by a dentist within six months following the first baby tooth or around 12 months of age. After the first visit to the dentist, making a regular dental visit every six month after that. A preventive treatment is much easier for you and your child than an emergency visit for advanced baby tooth decay. Injury to the teeth and mouth are common as children progress from crawling to walking. Do not offer starchy and sticky food (cookies, raisin, sweets, candies, chewing gum) to your children. These foods are difficult to clean and can adhere to teeth surface area for an extended time. This food feeds bacteria adheres to the tooth surface that in turn causes decay (cavity). Provide children with the selection of fruits and vegetable and motivate them to consume as snack foods in place of candies. Why is it important to keep baby teeth in their mouth until they have permanent teeth (adult teeth)? If a baby tooth is loose, with or without bleeding, and without displacement; no treatment required. But if the tooth is very loose, the dentist uses a splint to hold the tooth in place until it heals. The healing process takes place in few weeks. The tooth may turn dark or pink color. In most cases, after six months, the color of the tooth becomes lighter. It is important to observe whether there is any sign of infection after the trauma. If no infection, the tooth can remain in place with a crown for cosmetic purpose. If the tooth develops an infection, extraction or root canal treatment may be required. Root canal treatment on a baby tooth will only perform on the baby tooth that have long root left. The root canal filling is a resorbable material so it will not interfere with permanent tooth eruption. If a baby tooth came out of position, but still inside the gums, repositioning the tooth with finger pressure is recommended, preferably the same day of the accident. But if the re-position is not possible due to the permanent tooth underneath, orthodontic repositioning is the best choice. When the baby tooth being pushed up into the gums (intruded tooth); and the crown is still visible, the tooth will likely re-erupt back into position. But if the tooth is not visible, the baby tooth might need to be removed. If a baby tooth is completely out of the socket (displacement), this becomes a more dangerous situation. The dentist must be very careful not to disturb the underneath permanent tooth while re-positioning the tooth back into the socket. If the patient can not find the tooth, and the dentist suspects the tooth might get into the air passage, refer the child to a Pediatrician for further evaluation. If the patient finds the knocked-out tooth, the patient should wrap the tooth in a wet towel or cover with a salt solution (Save-A-Tooth) and bring to the dentist within few hours. For a permanent tooth or a baby tooth of a child age 3 or lower, the dentist might be able to reposition the tooth back into the socket. If the knocked out baby tooth occurs before age 2, there is a high percentage that there is damage to the developing permanent tooth beneath the baby tooth. If a baby tooth is missing, the dentist uses space maintainer to retain space for permanent tooth. If the knocked out baby tooth occurs after age 5, there is minimum chance that it will affect the tooth development in permanent tooth underneath. When the tooth injuries involve bleeding, the blood stains from outside leaks to inside the dental tubules in the dentin layer and turns to gray, black, or brown in few weeks. If there is no sign of infection, no treatment is necessary. If there is a sign of infection such as swelling, the dentist will confirm with an x-ray and may perform a root canal or extraction. When the tooth injuries involve bleeding, and the tooth color turns red shortly after injuries, it indicates that, the broken blood vessels inside the pulp chamber, stains the dentin and enamel. The color may change to a darker color later. The dentist may do root canal treatment or extraction. After weeks or months of trauma, the cell inside the tooth start destroys the hard structure in a pulp chamber, results in the bigger pulp chamber and a pink tooth. The dentist may not extract this tooth and let the internal resorption continue until the permanent tooth is ready to erupt. The yellow color is a result of calcification of dentin that is yellow, some dentin increases while the size of the pulp decreased (pulp canal obliteration). No treatment is necessary. All injuries influence the growth and development of permanent tooth underneath to some degrees. The extent of such damage depends upon what age the injuries occur. It is important to maintain good records on the history of baby tooth injuries, treatments and comments from the dentist for future reference. Question: My 10-year-old son has a swollen gum above his loose back tooth. Will this be a concern? Answer: If the swollen is firm or on the hard side, it could be a tooth bud. If it is soft and pus coming out when applying pressure, it could be an infection. The x-ray is an excellent tool to confirm the condition. Question: My 7-year old daughter has a new permanent tooth coming in behind the lower front of the baby tooth, is this normal? Answer: This is an ordinary event. Premature loss of a lower front baby tooth can cause an anterior cross-bite. My goal is to ensure that my teeth remain healthy. The only reason I don't have complete success listed above is because I'm in the middle of current treatment. My ten year old has a chip in her tooth and it has turned pink. The fractured piece is still in kind of just hanging there she isn't experiencing any pain and isn't sure of how the injury occurred, what should I do? I assumed it is her front tooth. The pink color that you see is the color of the blood supply to the tooth which is in the middle of the tooth - what that mean is the chipped area is very close to the center of the tooth (pulp) where the nerve and blood supply are located. You need to see the dentist as soon as possible to stop further damage to the tooth. In the meantime, just make sure she doesn't use that tooth to bite on anything. I don't suggest you to do anything at home. If the piece comes out, put it in a water and bring it to the dental office. I read the site very carefully.I have recently started a web site, the info you provide on this web site has helped me greatly.Add more TEETH WHITENING IN HOUSTON TX Teeth Whitening In Houston,TX,To figure out a solution of this issue, a technique of teeth whitening can be used, so that the white color of the teeth,best. Thanks for the cool information, I really love to spend time here going through these posts.. If a baby tooth is completely out of the socket (displacement), this becomes a more dangerous situation. The dentist must be very careful not to disturb the underneath permanent tooth while re-positioning the tooth back into the socket. Great to know that. Very informative post.